Universal Studios is one of the greatest and if not, the greatest and a must-go-to attraction in Singapore! No one wants to miss Universal Studio in Singapore, right? If you’ve been to Singapore but haven’t been to USS, then you haven’t been to Singapore yet! This must be on the top of your itinerary! Universal Studios Singapore is a theme park located within Resorts World Sentosa on Sentosa Island, Singapore. My partner and I decided to take a break at work and visit Singapore. 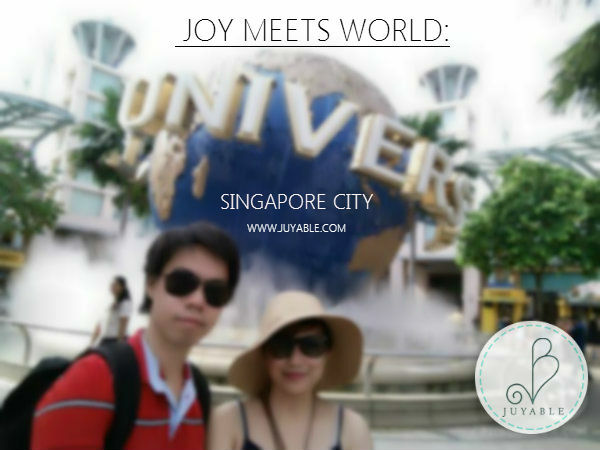 You may read about our Singapore adventures but let me tell you first about our USS experience. After our sumptuous breakfast, off we go to USS. I will give you a quick tour around USS. If you are looking for the best deal for your USS tour, I recommend AsiaTravel as they have the best deals out there! We were able to purchase a day pass for USS for two (2). Upon booking, you will receive an email confirmation and instructions on how to redeem your tickets. It includes Hotel transfer to USS. Don’t worry, it is so easy you won’t get lost as upon arrival to USS, the first thing you will see is this ticket booth (picture above) wherein you will redeem your tickets. Our ticket cost around 76 SGD. It is a Universal Studios Singapore E-Ticket with 1 way Transfer Service from hotel to Universal Studios. It also comes with a 5 SGD meal discount.You need not to worry when going back as they have a free ride to the mall and from there, you can make your way back to your hotel. One cool thing is that you can exit and re-enter USS anytime. They will stamp you with an ultraviolet stamp. At first, we thought the stamp has no ink but the staff told us that it is “UV” so we do not need to worry about that. Every one who enters USS must have this shot! If you see this rotating globe with the word “Universal” on it, then you are indeed in USS. Note: It is a little tricky to take a selfie since its rotating. USS is divided into several divisions. New York, Sci-Fi City, Ancient Egypt, The Lost World, Far Far Away, Madagascar and Hollywood. Each division have different attractions. Hollywood is the main entrance area of the park. Its only attraction, a broadway-style theatre, is accompanied by several restaurants and a variety of flagship shops. Being a replica of the Hollywood Boulevard, this zone is flanked by dynamic architecture and palm trees. It also features a replica of the famous Hollywood Walk of Fame.Special character appearances include: Po from Kung Fu Panda, Frankenstein's Monster, Woody Woodpecker, Winnie Woodpecker, Marilyn Monroe, Charlie Chaplin, Beetlejuice, Betty Boop and the Minions from Despicable Me. Oh, look at that joy! #minionCraze It seems that not only in the Philippines we have those minion craze! Madagascar is inspired by the hit DreamWorks Animation franchise of the same name which features four zoo animals, Alex, Gloria, Marty and Melman escaping from the Central Park Zoo and unfortunately crashing onto the island of Madagascar. The zone features lush tropical jungles as well as two rides. Special character appearances include: Alex, Gloria, King Julien, Skipper, Kowalski, Private and Rico. These are the attractions and booths found in Madagascar. And yes, photo ops are a must! #selfie Don’t worry, there are official USS photographers that will take pictures of you in which you can purchase. Far Far Away is inspired by DreamWorks Animation's hit Shrek franchise which depicted how the fairy-tale characters lived in daily life. The zone consists of many recognisable locations from the film series, and the main highlight of the zone is the 40-metre tall Far Far Away Castle Special character appearances include: Shrek, Donkey, Puss In Boots, Princess Fiona, Fairy Godmother, and Prince Charming. Welcome to the Galaxy Far Far Away… That ain’t right…Welcome to Far Far Away! Human for scale. In the King’s perspective, the view of the castle. We were able to get a hop on the attraction inside the castle. It’s a 4D ride. If you’ve been to Enchanted Kingdom, they are similar but this is in 3D which have moving seats and air that blows in your face. The Lost World contains many traditional attractions present in most Universal Studios parks around the world and is divided into two sub areas: Jurassic Park and Waterworld. Jurassic Park, based on the popular film franchise by Steven Spielberg and novels by Michael Crichton, features the newly redesigned Jurassic Park Rapids Adventure which is based on the popular water rides in other Universal Studios parks. Waterworld, based on the film Waterworld starring Kevin Costner, is a stadium that features a live show performance. These attractions are one of the longest. So we were not able to hop on it. Ancient Egypt is based on the historical adaptation of Ancient Egypt during the 1930s Golden Age of Egyptian Exploration. It features obelisks and pyramids which are typical of Ancient Egypt. Also featured are Pharaohs' tombs which were commonly discovered during that era. This zone relies on the depictions made in the popular film franchise, The Mummy, starring Brendan Fraser. For some reason, we find this place the hottest! Maybe because of how the “environment” was made? I promise you, of all the division we’ve been thru, this is the hottest part. Another human for scale. The queue on this ride is damn long! We were not able to hop on this one. Sci-Fi City is an imagined metropolis of the future that contains many modern conveniences of life, but with little or no remnants of past inhabitants and cultures that are able to stand the course of time. It is the home of the world's tallest pair of dueling roller coasters, at a height of 42.7 metres (140 ft). The pair of dueling roller coasters, Battlestar Galactica: Human vs. Cylon, are based on the hit television series, Battlestar Galactica. The one on the left is just a life size Optimus Prime, non moving. But on the right is the Optimus Prime mascot. New York is based on the original New York City, during the era of post-modernisation. This zone features various icons commonly portrayed in movies including the city skyline, neon lights, facades, and sidewalks. This zone also has a replica of the famous New York Public Library with two lion statues at its entrance. Special Sesame Street character appearances include: Elmo, Big Bird, Abby Cadabby, Bert, Ernie, Grover, Cookie Monster and Oscar the Grouch. We all love Sesame Street! Just in time, we were able to watch Cookie Monster, Oscar the grouch and Bert during their street performance! These are some Lego toys of the Transformers invading USS! Oh look at how the guy on the right screams! Must.. Take.. This.. Bite!! We had this burger and fries combo. Take note, the size of their burgers are not the same as ours here in the Philippines. This regular burger is as big as a double cheese burger. Just look at how wide her mouth is in order to take a bite! Our lunch cost around 25.90 SGD. And since we have a 10 USD discount (5 SGD each), we were able to spend 15.90 SGD instead. If you think chocolates here are expensive, no they are not!That’s what we thought at first. We suggest you buy those that can be only found here. We thought we can find those somewhere in Singapore but we can’t. We should have bought them already. Oh well. We were really glad that the weather cooperated with us. It was a bright, sunny day when we went to USS. We suggest you bring extra shirts and wear protective gears such as sunglasses, caps and don’t forget the sun block. The weather in Singapore is hotter compared to our country but not humid. So when you perspire, you won’t feel sticky unlike here. Singapore is known to have potable water which means clean drinking water everywhere. So you might want to bring an empty water bottle for you to refill as there are many drinking fountains all over USS. The next time we visit USS, we will surely try all attractions.